Thanks … have a great day! Beautiful ! What a nice surprise it had to have been to look up and see such a sight! Someone, somewhere in my tiny town has peacocks. I hear them calling to each other all day from whichever location I’m at (home, work, barn, etc.) A beautiful sight, but inescapable in sound. The thing that kills me is that, even though there are only handful of properties in this town, I CANNOT figure out where they actually live for the life of me! Mystery peacocks taunting innocent people… yeesh. He..she? is gorgeous! Can you imagine looking out your window and seeing that on your porch? lol. 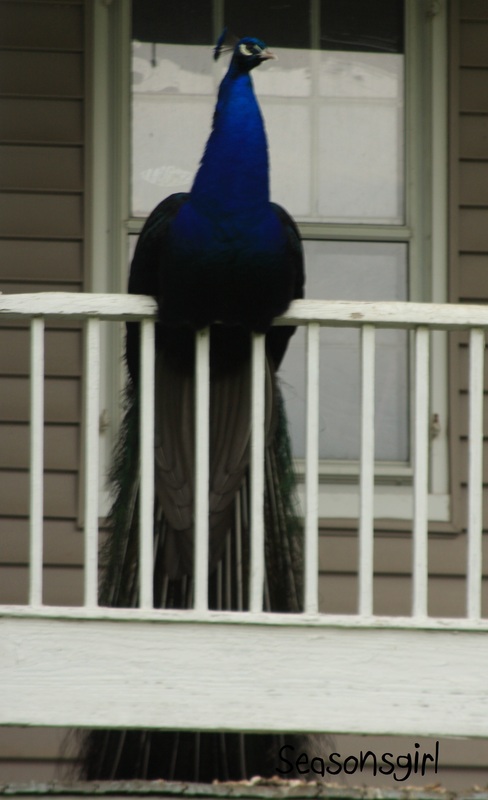 Wow that is amazing a peacock sitting on the railing just unreal, they are such a majestic bird. Great photo. Beautiful 🙂 So regal sitting on his perch in the dry. He did seem to think he owned the place. Too funny! I love this! What a great photo!